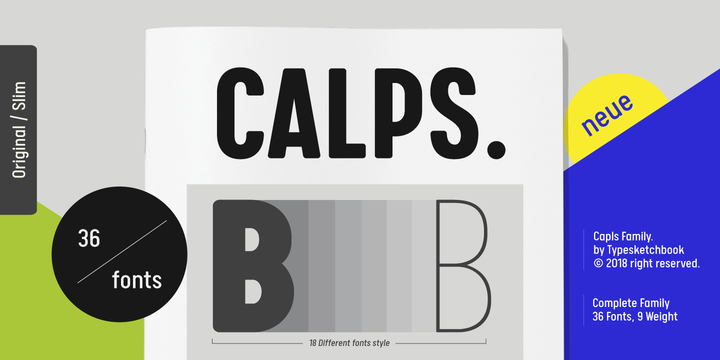 Calps is a contemporary typeface created by Chatnarong Jingsuphatada and published by Typesketchbook which is available in 36 styles, two widths (Regular & Slim) each with 9 weights (from Thin to XBlack) and italics and useful OpenType features. This condensed sans serif typeface is best for editorial use, headline design, nice in large scale. It merge well on all device. Enjoy! Styles: Thin, XLight, Light, SemiLight, Regular, Medium, Bold, Black, XBlack, Italics. Price: starting from $55,00 for one font to $160,00 for all 36 fonts. A font description published on Wednesday, March 21st, 2018 in Chatnarong Jingsuphatada, Fonts, Typesketchbook by Alexandra that has 1,990 views.